If it bleeds it leads. Nightcrawler certainly held the lead as one of the most interesting and compelling films of 2014. Anchored by an electric and transformative performance by Academy Award nominee Jake Gyllenhaal (Prisoners), the film follows Lou Bloom, a loner who muscles his way into the cut-throat world of nightcrawling as a freelance cameraman addicted to the high-speed world of Los Angeles crime reporting. As Lou excels at his job, he starts to blur the line between observer and participant to become the star of his own story. 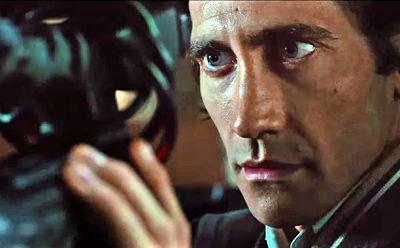 Jake Gyllenhaal is the Nightcrawler. The film is a family affair, expertly written and directed by Dan Gilroy (The Bourne Legacy), produced by his brother Tony Gilroy (Michael Clayton) and edited by another sibling, John Gilroy (Michael Clayton). Dan Gilroy earned an Academy Award nomination for his script and it is well-deserved. One of his best decisions was to write a strong role for his wife, the underrated and underutilized Rene Russo (Thor). Her turn as Nightcrawler’s Nina, a veteran news producer on the overnight shift to whom Lou sells his videos, should act as a kick in the pants to studios who seem to have forgotten about her. Russo and Gyllenhaal have a palpable chemistry and I hope they are paired up again soon. This chilling thriller was filmed in just 28 days in over 80 locations across L.A., proving you don’t need epic budgets and timelines to create an impressively original story that is as unpredictable as it is accessible. 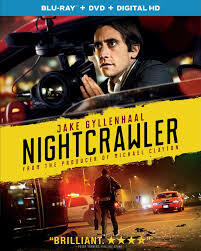 Nightcrawler lifts the hood to examine journalistic sensationalism and the twisted way networks report the news in an effort to feed the public’s thirst for tragedy while bolstering their all-important ratings. Lack of interesting bonus features aside, I suggest you run, don’t crawl, and grab a copy of Nightcrawler. Kitty Foyle takes her name from the Ginger Rogers film, the one which won her an Oscar, and that was all it took to make her a movie lover. Ms. Foyle is excited to add her insights to the great team at DishDisc.com.